after long-time I'm not writing any post, i decide to write it in English (pardon if there is a lot grammatical error). Why i decide to write it in English? First, i want to grow my blog visitor, because English is international language and easy to understand by international readers rather than my-Indonesian-language-post that translated by google translate isn't? Second, i want to practice my English language especially in writing. 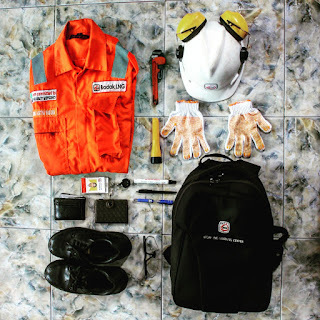 in this post, i want to show you my daily grid as an Trainee Field Operator in Badak LNG. As you know, after i finish my final project at February i continue my program as a trainee. It has been 4 month since first day in March. My institution located me in Process Train EFGH Section in Operation Department. Well... That's my dream because my major during my program in LNG Academy is gas processing major which make me study a lot of LNG processing and want to work as an Operator of LNG Plant. As you can see, based on newest regulation of Badak LNG that every personnel in field of zone 1 or plant must wear an appropriate coverall. Based on that, my first and the most important grid is coverall. My training coverall is from my uncle who works in Badak LNG as a Field Operator too. I rather use an earmuff than an earplug. Why? because it simple to use and always stick on my safety hat. This is my second safety shoes that given by Badak LNG. It has been a year stick on my my foot! Because hand-wheel is hard as steel, and your hand is not! This is where i put my document such as daily report, presentation report, and process textbooks and this is where i carry my raincoat. This stopcock is the most important equipment that operators must have. Many purposes such as giving extra inertia during move a hard hand-wheel. During night shift or want to see if there is any flow in drain line, this things will help you! This is the most important thing when you work as a Trainee, you must note what is important, and in this case, everything is important! Okaayy, thats all my grid! What yours? Dont hestitate to share with me, write that at the comment please! 5 Responses to "My Training Grip as a Field Operator"
Great decision to write your blog in English, dude! Keep the good work.